We finally arrived in Panama after an epic last hurrah surfing Pavones, Costa Rica. We were so stoked, partly because we were in desperate need of new tires and were dealing with ongoing mechanical problems. There is a ‘Zona Libre' between Panama and Costa Rica, where you can find almost anything you need at cost. We had our new tires within 2 hrs. of crossing, the border was super easy, we stocked up a few bottles of wine and were on our way. I loved Panama, the whole experience was really fresh and completely different from the rest of Central America. That is what each country has most in common. Central America is made up of completely diverse landscapes, people, and wildlife. Each country somehow strikingly different from the next, almost immediately as you cross the border. Panama is the epitome of this. After finally breaking out of Bocas Del Toro, we were relieved and renewed to move on as we were in the last small country before making our way to the great South American continent. Our chosen route would be from Colon to Cartagena, Colombia, shipping the van in a shared 40ft container. We planned to fly to Cartagena, book an AirB&B, and wait for Beast to arrive. But before that, we had a few stops to make before arriving in Panama City. The first of which was Boquete. There are multiple locations in the tropics that are labeled with the description, ‘eternal spring’. This consists of similar equations of longitude, latitude, and altitude. Basically, it’s heaven on earth. Boquete is one of these places. Typically, you will find excellent conditions for growing coffee plants, as well as cacao, avocados, exotic fruits, vegetables, and beautiful orchids, among other things. We blissed out for a week. There’s a lot of retired US citizens there, plus it’s a touristic hotspot which means there are plenty of excellent restaurants, cafe’s, supermarkets, local markets, breweries, and venues for live music. The only Volcano in Panama is right next door, part of a National Park, so there are some excellent hiking trails to be explored as well as the possibility of seeing the Caribbean sea and Pacific ocean at the same time from the top of the Volcano. Eternal spring also happens to be the most ideal temperature for van life, as it’s cool enough at night to sleep, damn near cold at times. Not complaining though, cooler climates are far more bearable than overly warm climates when living and traveling in a van. We were elated to be snuggling under the covers with our socks on after a month in the sweltering Caribbean heat, a defining characteristic of Bocas. We bade our gratitude to the Eternal Spring and made our way to the back to the coast, heading to the famed point of Santa Catalina. I’d seen some pictures of this wave and some somewhat recent footage making for a mixed and conflicting review of the wave. Allow me to clear that up for you. Santa Catalina was probably the best surf of the whole trip, absolutely pumping. Big looming sets, epic inside and out, the most glorious paddle out into the channel watching the most perfect waves you’ve ever seen pummeling the volcanic reef before you. A predominant right-hander, with some mystical left peaks that hardly anyone goes for. We stayed at Surfers Paradise, and paradise it was. This was the culmination of surfing through Central America. After the wave quality we’d already experienced, it really topped the charts. I still talk about this spot, and I always mention my 8’0” Magic Peanut shaped by La Mision surfboards, and how well it served me riding those perfect gems. Slipping in and out, around the pack, cleaning up anything that squeaked by and confidently snagging any set waves that slipped under the locals at the top of the peak. It’s basically an outer reef break, somewhat protected by some neighboring islands. Shaped by the the hand of God for your enjoyment. High tide only. We managed to tear ourselves away from Santa Catalina and went to visit a friend, someone who Ingrid had been chatting with since we talked about driving to Panama. Through facebook, seeing our posts, he would comment how amazing Panama is and we should come visit when we get there. Well turns out, we finally did just that. This story is funny because we realized that we didn’t really know each other but had a lot of mutual friends in common. Also, Steve never told his wife Adele we were coming, so she found out when we got to their door. It was all really funny and fun, and a whole lot of laughs. Steve surfs and both he and Adele are seasoned musicians, also Adele is an artist so we all hit it off right away. We meant to stay for one night but ended up staying longer, just jamming, chatting, and eating delicious home cooked meals in their beautiful house. It was an absolute joy and a privilege, we’ll be forever grateful to them. As well as all the wonderfully kind people who have been so friendly and hospitable along the way, welcoming us into there homes, offering us a bed and a bathroom, treating us like honored guests, it’s genuinely humbling. Steve’s story is somewhat unique, but as you continue on a journey like this you realize what people have in common. Steve, a most affable story teller, said he was traveling through Costa Rica with some mates and got to chatting with some guy in Tamarindo. Turns out this guy had a beautiful house and property nearby and invited them all to his place to hang out and enjoy the surroundings, taking it easy. I’m not sure if I’m telling it right but more or less, Steve said he was so taken aback that from then on, he vowed he would do the same thing for someone else one day, when he had the means to. This is the basic theme of the trip which is a life long lesson about sharing, caring, and passing along good fortune. We had a great time jamming with them, we talked about just settling down in Panama and starting the band again, I was totally game but we had plans already in motion. We pulled out of the driveway freshly showered and feeling really blessed, ready to start the final stretch to the Panama canal, symbolically the end of the road for us in Central America. It was a beautiful moment. We crossed the canal and felt a surge of achievement, proud to have made it so far, and grateful we were without any lasting trials and tribulations. It was a beautiful moment, I remember it well. It seems like a great distance between NY and Panama, but the truth is it’s not. It’s the places you stop along the way, the people you meet, and the experiences that make it so profound, and feel like so much more. North and Central America are supremely unique and beautiful places on the map. The earth is a marvelous gift most efficiently appreciated in my opinion, from the seat of a solid over landing vehicle equipped with what’s necessary to live comfortably in the wild. Because wild it is. 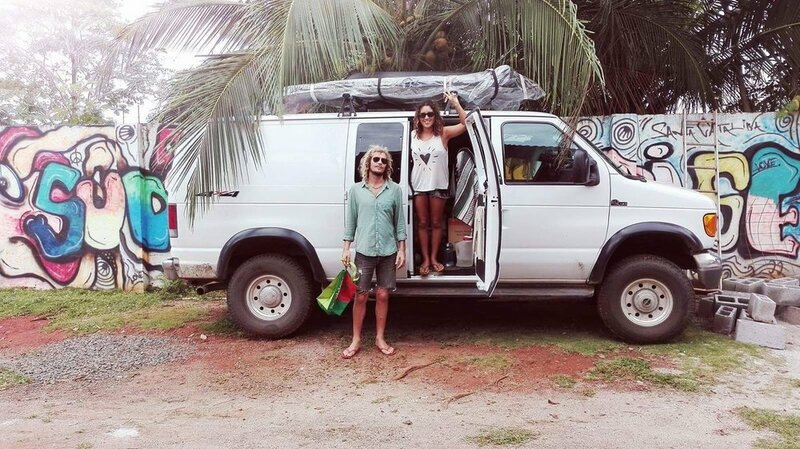 We arrived to Panama City and wasted no time initiating the process of shipping the van to Colombia. We met John and Mandi again, who had helped us find our partner van and we all met at the office of the shipping agency to get our vehicles registered and inspected. It was easy, don’t show up early, it won’t save you any time. We got to meet our container buddies, Tim and Hailey with an Astro van, with whom we would reconvene with in Colombia to retrieve our vehicles. The whole process from beginning to end was a riot, but completely entertaining and pure joy when you look at the big picture. More on that later. John and Mandi, our real travel partners, got a room in a sweet hotel with a huge parking lot and invited us to hang out, drink free coffee, and park in the shade, which we did all of. We walked the deserted promenade in the blistering heat beside the Canal, a romantic scene thinking back on it, but man was it hot. The Canal is beautiful. I had a lot feelings leading up to this about man constantly disrupting nature, typically anything man made will hardly last no matter the size, and nature should be respected and left to its own accord so on and so forth, but when you finally get the canal and see it with your own eyes, and see the account of it, the history of it’s construction and maintenance, realizing it was completed more than 100 years ago, the feeling changes to a profound respect for the intelligence, diligence, and fortitude of mankind and his ability to persist against all odds and persevere. Many great minds and hard working men came together to create and complete one of our crowning achievements, the Panama Canal. When you take a seat in the bleachers and watched a barge and a couple of sailboats lazily cruise through the canal, your mind will drift into a dreamlike state and you suddenly see yourself behind the helm of your own craft, sailing through the canal from the Atlantic to the Pacific, or vice versa and you may consider what events might have taken place for you to have got that moment. Truly awe inspiring. There was a guy who swam through the canal in the 30’s or 40’s for the world record. They charged him something like 35 cents. We drove the length of the Canal heading north, to the Port of Colon. We spent the night in a hotel prepping the van during the day, removing the boards and cargo box from the roof, putting them inside. We also brought beast to the car-wash, as it was in need of a bath. In the morning we met our tramitador in a parking lot with our friends John and Mandi + shipping partners, and drove as a group to the port where we would load our containers. It was easy and fun. Truly a once in a lifetime experience, making for a monumental moment in time. And just like that, we were without the beast, on a bus back to Panama city like a couple of backpackers with nothing to worry about but our shoes and passports.